Clixsense is not only a paid to click website. It is something more than this. Clixsense is a real business which if you focus and do things right, you can earn passive income every single day. Most new members though do not succeed for a number of reasons. Some of them don’t have the patient to work with a real business and others just don’t have the proper knowledge to market their ptc business. In this article I am giving you 8 easy-to-follow tips that will help you jump-start your journey with Clixsense. If you have any other tips you want to share with us, just leave a comment below this article. 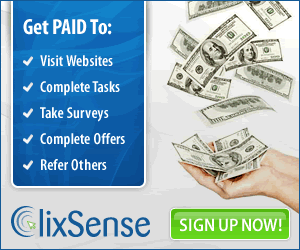 #1 Time: Give Clixsense some time to start generating income for you. You can’t expect Clixsense to start ”popping” cash to your PayPal account from the first day you join. You need to give it some time. Think of it as a real business. Do you know that most offline businesses take up to six months until their owners start earning money? Do you know what they do these six months? They build their business. They’re building their marketing plans and they are building their customer base (in your case your referrals). So, give some time to Clixsense. Work with it and give it some time to start generating serious income for you. #2 Traffic Exchanges: At the beginning of building your business, you need some free methods to acquire direct referrals. One of the easiest methods (not very effective though) to get direct referrals is with traffic exchanges. Traffic exchange websites, are websites that allow you to watch ads to get advertising credits. The more credits you have the more views you get to your business. There are hundred of traffic exchange websites on the internet. I’ve prepared a list of what I consider to be the best traffic exchanges, Check them here. #3 Splash Pages: The best method to promote Clixsense to traffic exchange websites is by using splash pages. If you go to the affiliates tab on your Clixsense dashboard, you’ll see the splash pages option. Click there and you’ll see two splash pages. Clixsense is probably the only ptc website that offers Splash pages. Splash pages are one page pages that are design to make the visitor convert. People on traffic exchange websites will see your website for a few seconds. So you want to grab their attention immediately and make them click on the join button. Normal affiliate pages have too much info on them making potential referrals leave the page instead joining. This is why splash pages convert better than your normal Clixsense affiliate link. #4 Autoresponders: Autoresponders are services that allow you to schedule a sequence of emails to be delivered to a list of emails. What i like to do is to take my referrals emails and adding them to a list with pre-scheduled emails. These emails include tips on how to succeed with Clixsense, tutorials and in general, everything I believe it will keep my direct referrals active and it will make them succeed with Clixsense. Not all autoresponders allow promoting make money online opportunities. Getresponse, is an autoresponder that is affiliate marketing and make money online friendly. So, if you are going to use this tip, make sure to join Getresponse. #5 Blogs: Creating a blog around the ptc industry and Clixsense, is probably the method that will get you the most direct referrals, hence it will help you grow your business faster. Blogs get traffic from search engines (like Google and Bing) if you can write informative content about your subject (ptc websites, Clixsense). If you cannot afford to create a self hosted blog (better than free blogs) then I suggest you create some free blogs. Here is a list with the most popular free blogging services. #6 Social Media: Everyone today seem to know what social media are. Social networks like tsu,Facebook and twitter can help you distribute your content to other audiences, hence maximizing your content’s chances of getting seen. What I like to do is to distribute every blog post I write to over 30 social networks I am a member with. Again, I’ve prepared a list with the most important social networks to distribute your content. Check it here. #7 PTC Forums: Forums are again an easy method to build your self a name, distribute your content and get some referrals. The most important thing you need to remember when joining a make money online forum is that you must NOT spam your affiliate link. Be helpful with other people and people will start following you. I suggest you read this article and this article. The first one outlines the mistakes i was making when I started with forum marketing and the other article is a list with the most important forums to join and build your name. #8 Paid To Click (PTC) sites: My last tip is that if you are willing to invest money to your ptc website (at the beginning to reap the rewards later), then i suggest you promote your Clixsense affiliate link to other ptc websites. BuxP and Neobux can bring you the best results if you advertise there. Make sure you use the splash pages offered by Clixsense and always buy fixed advertising on other ptc sites.